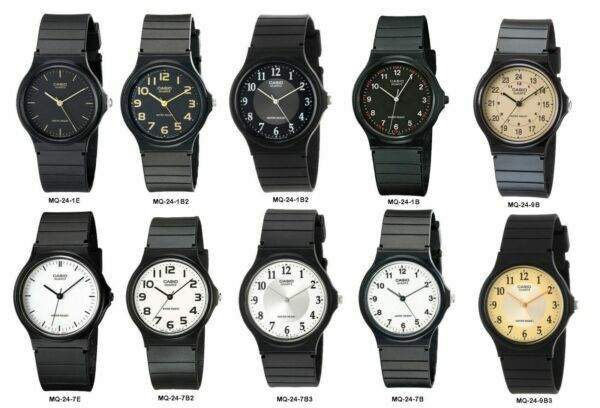 eBay Model: MQ24-1E/1B/1B2/1B3/7E/7B/7B2/7B3 MRSP: $24.95 Condition: 100% Authentic & Brand New Packaging: Casio Box, Instructions, & Warranty Warranty Type: 1 Year By Manufacturer Features Include: Water Resistant 3-Hand Analog Accuracy: +/-20 seconds per month Battery SR621SW Approx. battery life: 2 years Module 705 Size of case / total weight: 38.8 x 33.8.0 x 7.8mm / 19g WATCHSURPLUS INFO & POLICY Payment Policy: We only accept Paypal as payment Shipping Policy: We normally ship this item within 1 business days of receipt of payment. We ship only to CONFIRMED addresses when buyer pays using PayPal. US Domestic Shipping Options USPS 1ST Class Mail – 2 to 7 days for delivery from the day of shipping (Excluding Sun) USPS Priority Mail – 2 to 3 days for delivery from the day of shipping. (Excluding Sun) FEDEX Ground - 2 to 5 working days for delivery from the day of shipping. (Excluding Sat & Sun) Please Note all delivery times are approximate. International Shipping Options USPS 1st Class Mail International – 3 to 5 weeks for delivery, No Tracking Information is Available USPS Priority Mail International – less than 2 weeks for delivery USPS Express Mail International – less than 1 week for delivery FEDEX International Economy – less than 1 week for delivery Please Note if using USPS Priority Mail International Small Flat Rate Box, no watch box will be included with the shipment. Please Note all delivery times are approximate and may take longer depending on customs International Buyers Beware: There could be duty taxes upon item's arrival Customers are responsible for all duty charges and taxes Return Policy: To return for a refund, please send item and all of its content including the packing receipt within 21 days back to us. The item must be returned in the same condition as when shipped with all original packaging, tags and papers. All watches must be unworn, unaltered and in brand new condition. All watches will be inspected upon receiving. Buyer must notify us within 5 days of receiving the item to get the address and RA number. The buyer is responsible for shipping fees. About WATCHSURPLUS: Although we only have been selling watches and calculators on the internet since 2002, we have been in this business since 1984 and have been at the same brick and mortar location since 1989. All the products that we offer are 100% authentic and brand new. Watchsurplus.com is committed to providing each customer with the highest standard of customer service. Our Contact Information: WATCHSURPLUS Check out my other items!